From the under cabinet lighting in your kitchen to the sconces decorating the hallway, every aspect of your home lighting can illuminate the space in quality and comfort. Failing to properly plan your lighting scheme can create disastrous results, washing away the beauty of your home and causing eye strain for inhabitants and guests alike. One project that requires extra attention to detail is the chandelier. Modern chandeliers come in a wide range of sizes and styles to provide a better match for your unique style and budget. As your go-to lighting showrooms in Grandview and Grand Haven, The Lighting Corner is here to help Michigan residents find the absolute best fit for their needs. We specialize in outdoor and indoor lighting in the Jenison area, lighting your house with quality since 1984. Our designer lighting products come with affordable prices and expert advice. One area that many homeowners struggle with is determining the right size and style of chandelier to utilize in their home. Today, we’ll look at a few considerations that may help you in finding the right chandelier for your Michigan home. If you are in need of professional assistance, be sure to stop by one of our lighting showrooms for help! While we all strive to install stunning hanging light fixtures in our home, the truth of the matter is that your budget will have the final say in the quality of your home renovations. Home chandeliers come in a vast variety of finishes and sizes, allowing for serious variations when it comes to the price tag. Begin shopping for modern chandeliers through our online catalog to see what kind of costs you will be working with in relation to your budget. We never recommend taking the cheap route on beautiful lighting fixtures, but it is important to know that you can find all types of styles and prices. If you need assistance in determining a quality budget, The Lighting Corner is always happy to help! As the focal point in most rooms, the chandelier helps to set the tone for your space. As such, it’s important to find a new chandelier that matches the theme of your room. Since chandeliers come in a wide range of styles, it’s often recommended to look for a fixture based on your house styling: Modern, traditional, eclectic, contemporary, and so on. Failing to meet the style of the rest of your kitchen, dining room, or other space can create conflict within the room and detract from the beauty that you have worked hard to achieve. The color, style, material composition, and accessories of a chandelier can help to enhance or detract from the beauty of your home. When shopping for the best results, be sure to be mindful of the entire space to find a good match. Where you place your modern chandelier and how big that space is plays a major role in determining the best style for your new lighting. Chandeliers that look grand in the foyer or living room will not look the same when installed in a private bedroom. The dimensions of your room will also determine the best size of chandelier for your home. Placing a small light fixture in a large space, for example, will make the room feel disjointed and empty. Rooms that are under 100 square feet, for example, should utilize chandeliers with smaller diameters, ranging between 17 and 19 inches. Rooms that are over 400 square feet can benefit from a new chandelier that is over 40 inches in width. Chandeliers that are too large can crowd people and make the space feel much smaller than it actually is. It’s important to consider the space you are taking up, such as other fixtures that may dominate the space in conjunction with a stylish chandelier. Beyond the room’s size, the ceiling height also plays a major role in the scope of your new chandelier. As a rule of thumb, higher ceilings require more elaborate chandeliers to cover the distance, including multi-tier products that fill the space without crowding it. Conversely, lower heights should necessitate shopping for shorter chandeliers that do not impose on your living space below. It’s important to size your chandelier to the room and its fixtures. Dining room chandeliers, for example, should sit between 36 and 40 inches above the table. This will help you to determine your chain length in addition to the height of your new chandelier. Homeowners who want a decorational chandelier can get away with fewer light sources while those in need of full-room illumination will benefit most from brighter options. Shades and covers can be useful in customizing your light output if you found the absolute perfect fixture for your space. Remember that speciality bulbs, while decorative and beautiful, can cost you time and money when replacements are needed. If you are considering a modern chandelier to improve the comfort and beauty of your home, it’s important to choose the best option to enhance your space. 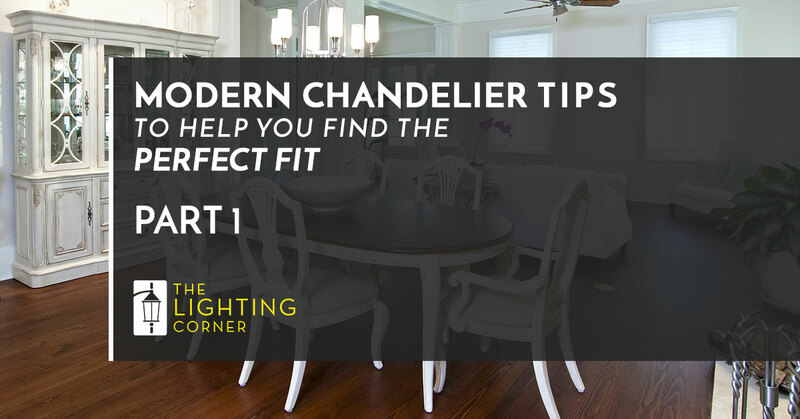 Next time, we’ll continue this topic by highlighting a few more considerations when shopping for a new chandelier. If you need help with your outdoor or indoor lighting in the Jenison area, The Lighting Corner is here to help! Our expansive showrooms in Grandville and Grand Haven have the products and expert guidance needed to create gorgeous outcomes for your home. Contact us today to learn more! ©2019 The Lighting Corner | All rights reserved.